While not having any clue when/if I'll get pregnant is obviously difficult, there are several layers to this "weighting game" that make it even more frustrating beyond just the emotional aspects. For instance - I want to get my pre-pregnancy body back. But I'll admit that I'm not gung-ho about it because, really, what's the point if I'm just going to get pregnant again? Each month I set goals...fitness goals, healthy eating goals, etc...but then there's the "I might be pregnant" question mark in the air that provides just enough irrational thinking (and excuses) for me to "take it easy" and curl up on the couch rather than lace up my tennis shoes. Not knowing when I can take back control of my body is extremely annoying. Believe me, I want to have another baby more than I want to look like I did in high school, but I'd also like to have all the baby-making behind me so I can focus more intently on getting back in shape. 2 YEARS of Weight Watchers Magazine for just $14.99! 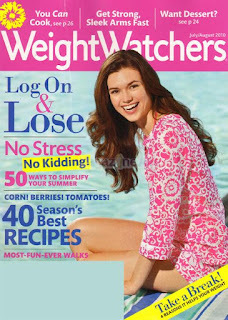 With this deal you get a 2 year subscription (12 issues) to Weight Watchers Magazine for only $14.99. Why pay $160.20 when you don't have to? Quantities are limited so click here to get this before it's gone! * Disclosure - this deal is available to More Skees Please through an affiliate relationship with Broadcast Bloggers. While I will receive a percentage of each product purchased using the above link, I was not compensated for sharing the deal through the above blog post and all opinions are my own.